Drumroll please..... - Stop staring and start sewing! Alrighty then! 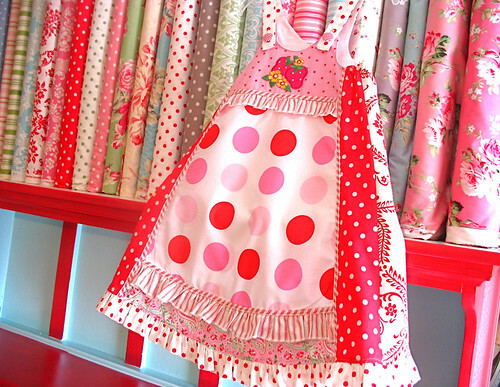 The winner of the cute strawberry dishtowels and the Georgie fabric is Rebecca who left this comment at 2:41 on Aug 7th "Just found your blog, and love the skirt. Plus I really need to stop staring and start sewing, maybe tomorrow :)". 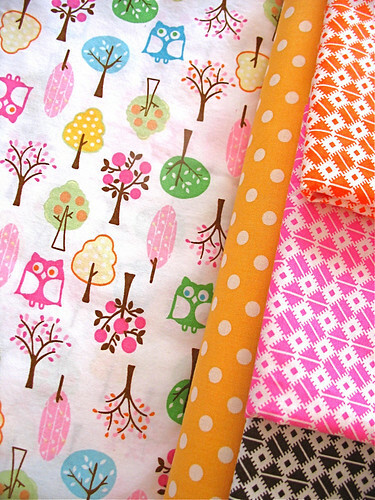 Rebecca, you are out of excuses because these gorgeous fabrics are on their way. Yip yip! I've been taking a bit of sewing break this last week and it's actually been kind of nice. 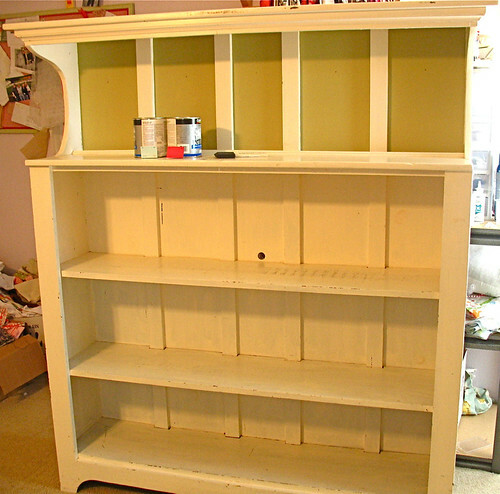 I took a day to paint some shelves and they turned out pretty cute. I realized partway through that I should've used some primer first but oh well. I actually took a swatch of Tanya Whelan's fabric (the ruby dots) to the store with me to get matching paint. That dress is the Vida pattern from Farbenmix. I finally set up my account with them and they are the nicest folks. Isn't it cute? I found those big pink dots at Pottery Barn Kids (it's from a sheet set) and couldn't wait to make something with them. I exercised restraint and only bought a pillowcase (14.00) but that's still plenty of fabric for little clothes. Oh, here are my shelves before I started. Here's another pillow case that I bought at Pottery Barn. Isn't this great? I adore these owls. 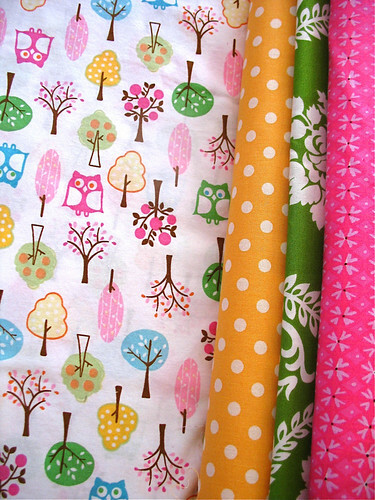 I think it will look great with these other fabrics. Or maybe combined with these? Anyway, we've had some excitement around here at Casa Fabritopia. Our little guy seems to have broken his arm and since there were no witnesses we think the cat did it. He will go see the specialist tomorrow and we're hoping and praying that he doesn't need surgery. In the meantime we are trying to keep him comfortable and entertained. 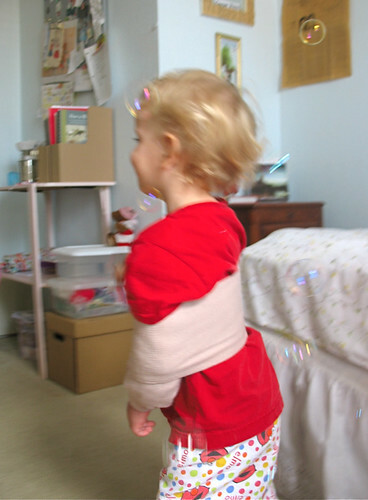 Bubbles always help. And Elmo pants help too. Always. I know a lot of people are wondering about the Farmer's Market order. Well I called the people at Michael Miller and my order "slipped through the cracks" (ugh) and should be here next week. And I'm expecting a large order (32 bolts) from Free Spirit around the same time (More Pop Garden, Bijoux, and Garden Party!). Fun!